Overall consumption of video increases significantly on Web. I have been saying this since my days at AtomFilms but it really does happen in 2009. Video advertising is finally going to get some traction. Higher quality will bring more eyeballs. There are some even better video predictions from my friend Alex Castro of Delve Networks (in full disclosure, I am an advisor to his company). His are spot on. I do disagree with his prediction that YouTube will lose market share. I think they'll grow from their current market share of videos watched from 37% to 45%. Contrary to a number of predictions, there will be more ad networks versus less. With 80% of the ad supply being sold thru indirect channels there will be more than less ad networks. 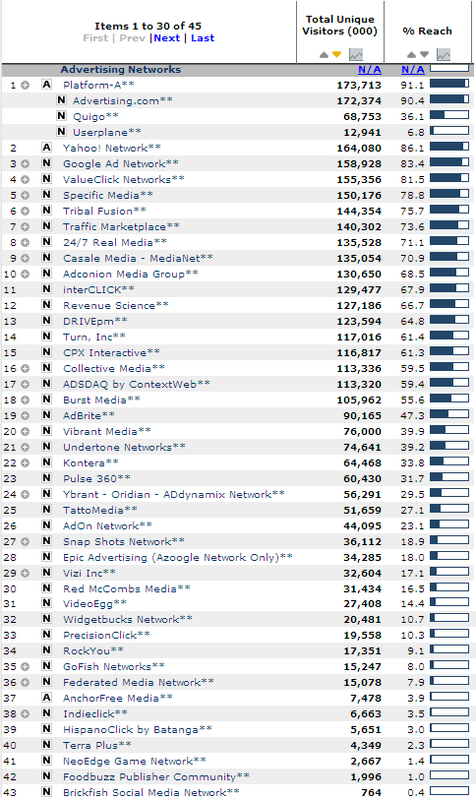 There will be better control over supply by publishers and everyone on this Comscore list (View this photo ) will be there by the end of 2009. Anyone who is building unique IP will have a chance at an acquisition. Yield technology in advertising is going to be a big theme in 2009 since all other forms of targeting are basically commodities. We don't have the IT budgets that we once did. Smaller and simpler devices will take off. For example, industry sources say more than 11 million netbooks worldwide were sold in 2008, up from just around a million in 2007. Netbook sales will easily double in the new year. Also, the majority of all phones next year will be smart phones (over 50%). There are going to be tons and tons of consolidations in the technology space. Big guys will buy big guys. Small guys will merge with small guys. Small guys will get bought by big guys. There will be a lot of great deals out there for companies with capital. There are massive layoffs and the economy is bad. Per the above, when consolidation happens, unemployment increases. People are only an hour away from registering online for a new business. That combined with free SaaS (Software As A Service) software and easily registering for a domain name -- you've got the makings of a business. There is an estimated 27.2 million small businesses in the United States and they employ 40% of high tech workers. New small business registrations will grow by one or two points in 2009. 2009 will be the year of cloud computing. The companies that benefit are: Amazon, Hewlett-Packard, Sun Microsystems, IBM, and Microsoft. In addition, SaaS takes off even more. With the worldwide economy in trouble, lots of layoffs, and pockets that are bare, SaaS will take off more than ever as measured by overall consumer adoption of the Internet business population. Windows 7 will ship on-time (not in 2009 for an SP1 but it will be solid enough to get their mojo back). Vista will feel like a bad hangover. Windows 7 will be faster, more usable, and introduce some cool virtualization features. Google will start to OEM an OS to PC manufacturers but Windows 7 and Microsoft's business juggernaut will successfully relegate it to a minor initiative. Facebook realizes that it needs a revenue stream. Microsoft needs a platform to grow search share. Facebook and Microsoft do a deal to change the search marketplace by integrating better social search. The valuation gets a major haircut from their $15 billion valuation (crazy 100x sales valuation). The deal gets done at big (crazy?) multiple at 20-25x or around $10 billion. Microsoft can buy 100 more little companies to try to grow search share or do a big deal. Plus, Microsoft shouldn’t let Google hook their FriendConnect initiative around such a large social hub like Facebook. They ditch buying the Yahoo search business and look to change the search game on the social side. ...And then they buy Yahoo's search business. Deal is done in May of 2009. ** The following Seattle-based companies will be acquired in 2009: BuddyTV, Visible Technologies, EvoLanding, and Urban Spoon. M&A in 2009? Heck, it can happen and these companies have gotten scale and have relatively low invested capital. 2009 should be really interesting. Love it, one of the best list of tech predictions I've seen. I highly doubt MS will be able to purchase Facebook and Yahoo within the same year. And I'm also surprise to see how new ad networks startups always come out in mass numbers during recessions. Happened back in early 2000.